One day in the summer of 1958, Don Garlits was making a guest appearance at the Kohler drag strip. Desperate to attend but not old enough to have a license, FJ Smith had his father drop him off at the gate. Smith was instantly hooked on drag racing. Little did he know that drag racing would eventually become his career. Throughout his high school and university years, Smith raced as a hobby with a variety of cars (a 1937 Ford Coupe, a 1955 Chevy, and a 1958 Pontiac, to name a few). His 1967 Beaumont raced at the Niagara Dragstrip, became internationally known as the Canadian Chevelle. 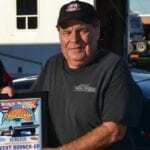 While teaching at the Cayuga Secondary School, Smith had many friends who relied heavily on his automotive and drag racing knowledge. In 1976, he built a 1967 Camaro that became a NHRA legend. 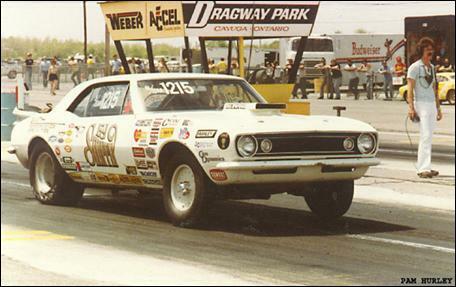 He campaigned the car almost every weekend at NHRA Divisional and National events in Canada and the United States from 1976 to 1983. The car was originally built as a modified vehicle and was known for its innovative 4-link suspension and wheel stands. 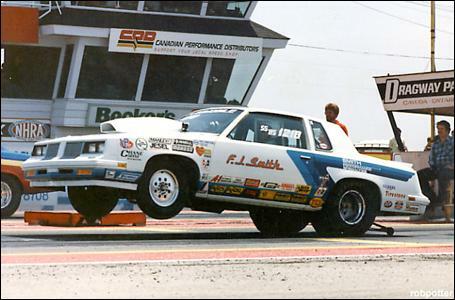 In 1982, after teaching high school for 16 years, Smith resigned from his position and established Smith Performance Specialties, a state-of-the-art high performance engine and chassis fabrication business. In 1986 during a rained out race, Smith approached General Motors personnel about the possibility of a front wheel conversion drag race car. The rest is history! The first car built by Smith became the prototype for all front wheel conversion racecars in the National Hot Rod Association. This achievement saved the Super Stock eliminator from extinction. The Oldsmobile Cutlass Ciera was featured in the Oldsmobile display booth at SEMA in Las Vegas in 1987. Smith’s partnership with General Motors Oldsmobile and later Pontiac enabled him to create a Super Stock mini factory. Endless class wins, victories at National events, Best Engineered awards and other records achieved by Smith’s cars (as well as racers of the Smith Performance Super Stockers) put “FJ Smith” at the international forefront. These racers contributed hundreds of points towards Oldsmobile winning the Manufacturer’s Cup for numerous years. The shelves in Smith’s offices are packed with 60 Iron Man trophies he won for overall Eliminators, class wins and Best Engineering awards. During this hectic time, Smith became the father of two daughters born in 1979 and 1983. His daughter, Kathleen is married to a Volkswagen/Audi product manager, and provides vital support to Smith’s team. His second daughter, Victoria grew up in Smith’s shop. Her passion for racing was no surprise and in 2007, she was elected Canadian Sportsman Racer of the Year. She also won the Can-Am Stock/Super Stock series, driving the Smith Performance 2006 Pontiac Sunfire, which she still races today. Obviously, Smith daughters’ early immersion in the drag racing world gave them a positive attitude towards automotive motorsports. There have been numerous highlights in the Smith family drag racing career. One is definitely the family’s recognition at the Car Craft All Star Drag Racing banquet at Indianapolis Hilton in 1992, and the presentation of the first Car Craft Sportsman Chassis Builder award to FJ Smith. He eventually won the Car Craft award again in 1993, and again in the final year of its presentation in 2000. It is interesting to note that drag race cars built by Smith in the early 1990s still sell for high prices on the market. The “Built by FJ Smith” stamp carries tremendous value today. 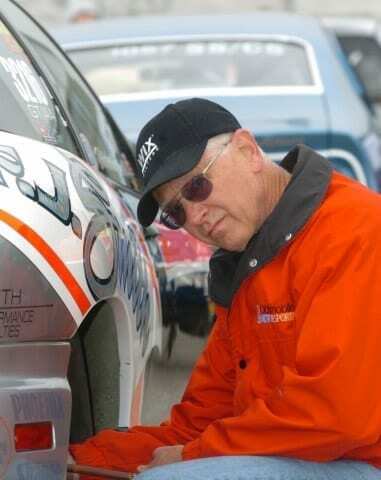 Some of his racecars still continue to dominate the Super Stock NHRA and IHRA point series. For many years Smith sat on the S.F.I. chassis committee and played a significant role in the development of the Spec 25-1 for “door slammers”. In 1995 the Can-Am Stock/Super Stock Series was developed and Smith has continued to play a major role in its continued success. Due to the significant travelling costs and time constraints, many Stock and Super Stock racers are unable to compete internationally at NHRA and IHRA events. However, this series has allowed racers to continue their passion and to race with the best Ontario, Quebec, New York and Michigan has to offer. Smith has singlehandedly increased the sponsorship lists from a meager four or five sponsors in 1995, to over thirty major sponsors (including Strange Engineering, Edelbrock, Mr. Gasket, MSD, Comp Cams, TCI, Auto Meter and ATI). Smith is a fiercely proud Canadian drag racer and has become a mentor to numerous young drag race competitors. 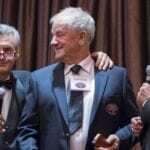 One factor that contributed to his induction into the Canadian Motorsports Hall of Fame in 2010 is his unparalleled integrity. In his office, Smith displays a photo of Zoro Arkus-Duntov (Corvette legend), Bill Jenkins (Small Block high performance Chevrolet) and Smith himself, taken at the SuperFlow Dyno conference held in Colorado Springs in 1991. At this conference, the three men were keynote speakers. The photo is affectionately known as “two-and-a-half legends” in the Smith office.